Explore the mystery of Morocco’s unexpected treasures, winding alleyways, and stunning natural beauty. 6 nights in a sumptuous Moroccan riad. Enjoy a curated itinerary filled with experiences only an insider could access. Email support and outstanding customer service before, during and after your travel experience with us. A professional photographer on hand to capture every magical Moroccan moment. Each morning, you'll receive a new collection of images, and by the end of the trip, you'll rack up hundreds of professional photos. See (and eat) the things you’d never find on your own. Travel like a Moroccan local. Did we say stress free? Just show up and we’ll handle the rest. We’ll take care of you like a freshly brewed mint tea in a desert oasis. You’ll sleep in an authentic Moroccan riad, centrally located inside the Marrakech medina. 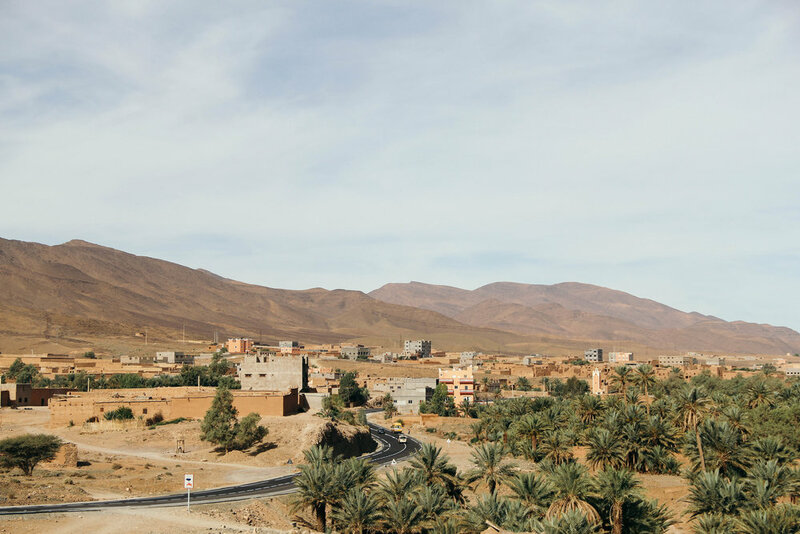 Each day, you’ll explore a new part of Marrakech and its surrounding areas, basking in the art and culture of the city, exploring the quiet majesty of the nearby mountains, and everything in between. You'll experience Moroccan life in a way that isn’t available to tourists. 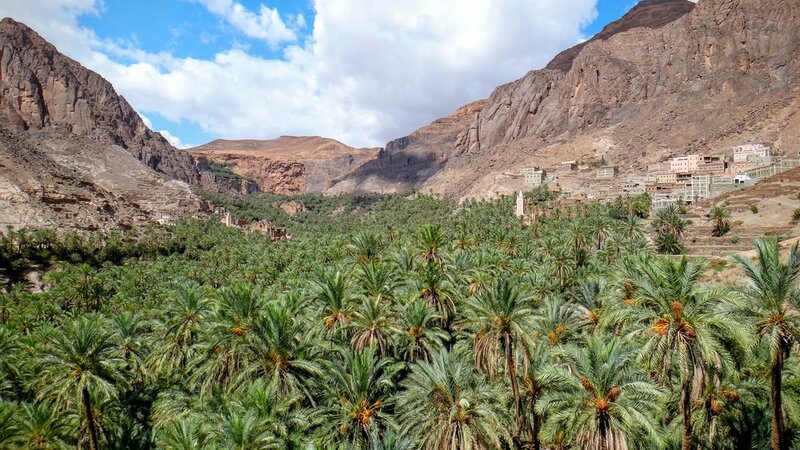 On this trip you’ll live like a Moroccan — cooking authentic meals, befriending the artists and textile weavers who sell their wares in the medina, spending time with local villagers, and so much more. The dusky walls and maze-like alleys of the medina offer an endless sensory buffet of local spices, hand-dyed leather, and ornate lanterns, all waiting to be discovered. The warm desert air is steeped in music and sweet mint tea. After a day spent navigating the frenzied medina, unwind in the soothing steam of a local hammam. At night, the senses continue to be dazzled by warm, earthy spices, lively musicians, and Moroccan storytelling. A Travel Noire Experience is easier and more authentic than trying to traverse the narrow maze of the medina by yourself, nose buried in your guidebook, hoping you luck into that life-changing meal or one-of-a-kind souvenir. You'll get to travel with some of the best people from all around the world and navigate an unfamiliar environment with someone who understands the culture and knows the turf. With Travel Noire, you’ll get backstage-pass access to the most authentic, immersive experiences, compressed into one week of phenomenal highlights. Over the past few years, we’ve had the honor of creating lifelong memories for thousands of travelers just like you, and we’d love the opportunity to do that for you too. Marrakech is a heady mixture of Berber caravan culture, sumptuous Saadian palaces and delicious food. 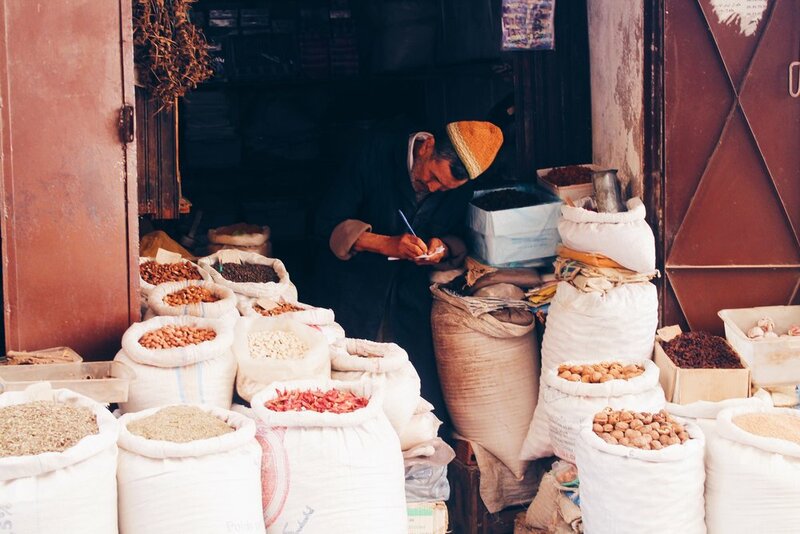 Lose yourself in the medina, and you might find yourself face-to-face with a spice market, or discover an expansive, ornate palace behind the most nondescript souq entrance. In contrast, the snow-capped mountains on the outskirts of town offer a tranquil, stunning landscape, and the friendliest locals you’ll meet. If sensory overload had a home, it would be in Morocco. Traveling alone, you’d need a whole day (maybe more) just to get your bearings — and even then, the real, rare gems would be hidden under all that frenetic energy. Traveling with us is like having a backstage pass. ALL YOU HAVE TO DO IS SHOW UP. WE HAVE EVERYTHING PLANNED FOR YOU. You’re not just another booking number to us. You’re an honored guest and a valuable part of our family. No matter what time of day or night (even in the wee hours of the morning), you can count on us. We've built this brand from nothing to sold-out-in-hours, because we truly care about people and their journeys. Immerse yourself in an exotic experience. Every day you’ll eat a Moroccan diet full of fresh vegetables, healing spices, and local seafood or meat. We’ll also be walking daily, including a beautiful hike into the hills and valleys outside of Marrakech. In a work-obsessed culture, busy is glorified, and financial wealth is superior to emotional or spiritual wealth. But this trip is about putting inner wealth and health first. Who doesn’t need more time to connect with the person you’re meant to be. You’ll land in Marrakech in mid-afternoon and get a chance to meet your fellow travelers in person for the first time (yay!). Once you’ve had the chance to get acquainted, you’ll board the private Travel Noire shuttle to your riad, where you’ll be staying for the duration of the trip. The rest of the afternoon is yours to explore, relax, and get settled in your new surroundings. In the evening, we’ll be treated to a multi-course meal in a quiet, elegant hotel, a stylish combination of Moroccan and European decor, surrounded by organic vegetable gardens, exotic flowers, and rich aromatics. After dinner, we’ll retreat to the hotelier’s private home for an intimate, familial welcome complete with candlelight, good conversation, and maybe even some cuddle time with her two sweet dogs. An unforgettable way to kick off your stay in Morocco. After an early breakfast, we’re privy to a behind-the-scenes peek at one of the most intense, intoxicating, and quintessentially Moroccan experiences — the Marrakech medina. As the local vendors and artists set up shop, we’ll get a rare glimpse of what the medina’s like before it fills up with entertainers, tourists, and street performers, and learn about the history and craftsmanship of their wares. As the morning wears on, we’ll get lost in the never ending maze of metalwork, carpets, tanneries, olives, spices, and jewelry, before stopping for lunch at one of our favorite places in Marrakech. This beautiful riad is covered in original artwork from floor to ceiling — a perfect spot for some one-on-one time with the photographer, hint hint. After our Moroccan lunch, we’ll be splitting into small groups for an intimate dinner in the homes of Moroccan locals. This morning, we’re traveling to a beautiful outdoor facility that houses an elite culinary training program, using fresh produce, herbs, and spices grown right on site. After a tour of the gardens, your culinary chops will be put to the test as we learn to cook a traditional Moroccan meal. After we feast on the results of our hard work, we’re heading to a gorgeous villa on the outskirts of Marrakech, for an evening of live music and delicious food. After a leisurely morning and a sumptuous breakfast, the day is yours to explore, experience, and relax. Get lost in the medina, people-watch from a street side café, dip into a hammam for some relaxation and pampering, or visit some of the many architectural marvels Marrakech has to offer. If you’re feeling adventurous, we encourage you to hop a taxi and explore the city and its striking cultivated gardens by car. Enough city life — today is all about the natural beauty of the Atlas mountains, experiencing life as a Berber, and taking in the breathtaking views from one of the tallest peaks in Morocco. After breakfast, we’ll take a short trip to a small mountain settlement, where we’ll hike into the village and eat lunch with locals. The crisp, clear air is a welcome reprieve from the heat and craziness of the city, and the sweeping mountain vistas offer a stark contrast to the narrow nooks and crannies of the Marrakech medina. The people in this part of Morocco are the friendliest, most welcoming people you’ll meet. Today is all about textiles, a staple of the Moroccan culture and one of the country’s main exports. We’ll travel to a small village outside Marrakech, where we’ll be in and out of people’s homes, learning about the history, tradition, and techniques of everything that goes into textile-making, from spinning and dyeing the wool, to weaving the fabric, to selling at market. That evening, we’ll gather in an olive grove on the outskirts of Marrakech, where the ancient olive trees and tranquil landscape provide a soothing contrast to the closeness of the city. Our farewell dinner is Moroccan style at its best — we’ll dine in a sumptuous tent, seated on the floor, surrounded by red and gold tapestries, lit by the glow of the lanterns, eating with our hands. Thank you, Morocco! If you’d like to get up early for a final fix of Marrakech, you’re welcome to do so before breakfast! After we eat, the Travel Noire shuttle will depart for the Marrakech airport. Tearful goodbyes and promises to come back will ensue. 6 nights at a locally owned riad. Day trips, guides and transportation to neighboring towns around Marrakech. All breakfasts, 4 lunches, 4 dinners (alcohol not included). Accommodation is in a shared room with one other person. We may also have a small number of private rooms. You can submit a request after registering. Your investment does not include your flight to Marrakech. Everything is organized so you stay sane. Arrive before 1pm local time on the first day of your Experience and our private driver will get you and a few others from your group to and from the airport. You’ll receive an invitation to join our private Facebook Group for registered guests only. Connect to others before you go and maintain friendships when you return. WE’VE LIMITED OUR MOROCCAN EXPERIENCE TO 14 PEOPLE. WE WANT YOU TO FEEL LIKE YOU’RE TRAVELING WITH FRIENDS, NOT A FOOTBALL TEAM. You'll get the real deal Morocco, not the things you can find in a guidebook. WILL THIS BE YOUR FIRST TRIP TO MOROCCO? HAVE YOU ALREADY VISITED MARRAKECH? Incredible. So you know how amazing it is — and how much there is to see and do (and eat) there! But think of how much richer your experience could be when you travel with someone who knows the locals and all the secret spots? Unless you have a Moroccan friend and stayed with them at their home, it's impossible not to feel like a tourist. We offer an alternative to that. Hoohmygosh, you are in for the biggest treat. If it’s your first time, you’ll love the safety of traveling with our group, and the ease of having all your hotels, transportation, activities and meals sorted out for you. You’ll love that you won’t have to worry about getting lost, ripped off, or hassling with foreign currency. We take care of everything. HOLD YOUR CAMELS. THIS TRIP ISN’T FOR EVERYONE. You’re not afraid to try new things, including but not limited to some amazing cuisine. You’re down with some strenuous physical exercise. You have a tendency to be negative or dramatic, or are just plain depressing to be around. You're a wild party animal that doesn't respect local cultures. You’ll sleep in the same locale for 6 nights. Our hotel is a charming locally owned riad in the heart of the Marrakech medina. Great idea! We’ll give you tips. Great — you’ll fit right in as our guests are looking for something different, too. Think of this as a trip planned by a local friend, something you would never be able to pull off on your own. We offer you daily activities but don’t feel pressured to do anything — it’s your experience. WILL I BE TOO OLD, OR TOO YOUNG? "There’s a difference between a tourist and a traveler. I spent an incredible week with 12 new friends exploring the cultural fabric of Italy, its people, and cuisine. I met with local business owners, lifelong residents, and participated in activities that I’d never be able to find on my own. I couldn’t imagine a more seamless experiencethat allowed me to visit the Amalfi Coast as a true traveler, not a tourist. I came back home revitalized with a new perspective on my own life and future." "While I've always wanted to travel the world, I never liked waiting on friends and family to travel. I was hesitant about purchasing a TN Experience because I'd never traveled that far away on my own before and I didn't know anyone who'd taken a TN Experience who could vouch for it. After arriving, it didn't take long for me to realize that this was one of the best decisions of my life. Within only 24 hours the group, including the TN Experience Designer, started to feel like friends I'd had for years. The trip cemented in my mind that this was the best way to travel (not to mention, it didn't suffocate my bank account)! I've already recommended TN Experiences to several friends -- it's an amazing experience for a lot less than you'd pay if you planned it yourself: beautiful hotel, reliable transportation, great activities, meals and a photographer who documents all of your memories!" "After my second TN Experience, I feel like a kid who is no longer afraid to move to the next grade level. I'm more confident in my preparation and attitude towards the unknown. I've also expanded the value that I place on building new and healthy relationships. TN Experiences provide a unique and safe space for people to be their most authentic self while challenging them to think further. What you will get from a TN Experience is way more valuable than what you may save from missing out!" As you may know, Morocco is a heady blend of color, spice, and sound. 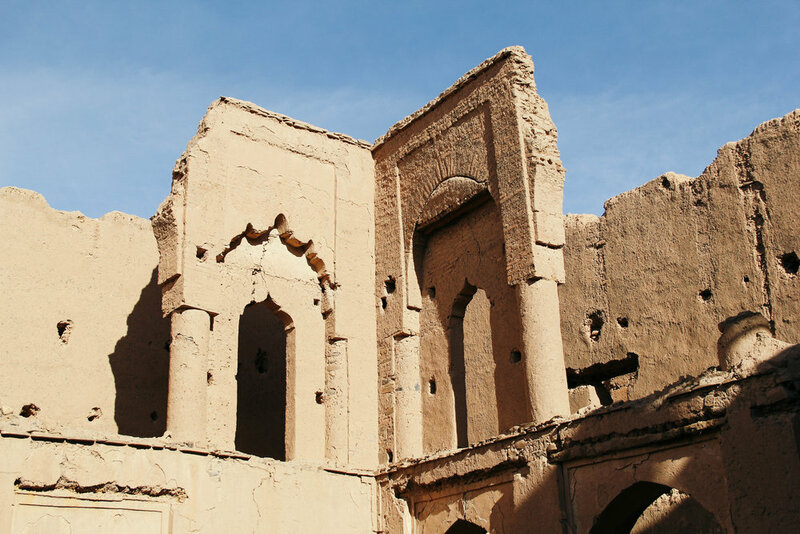 The ancient walls of the Marrakech medina are a sandy, ochre contrast to the snow-capped peaks of the Atlas mountains. For a whole week, you’ll be immersed in traditional Moroccan architecture, vibrant souqs, remote mountain trails, and authentic Moroccan food. We don’t run from city to city. We stay in the same riad all week, occasionally day-tripping to a few hand-picked highlights throughout the week. That way, you have the time and space to form a special connection to this land, its people, and your new friends.